If you like zombie movies or Marilyn Manson, you should try these creepy White Zombie contact lenses from ColourVue. With them your Halloween costume is almost ready! 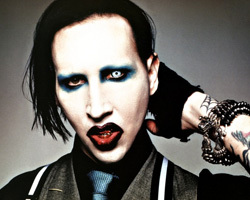 With ColourVue White Zombie contacts your eyes will gain that creepy, scary look - just like the one of the Marilyn Manson head singer. They are ideal for zombie walks and Halloween parties but also can be used in theatrical events when a proper costume matters. What's great about them is the fact that you can wear them all day as they are very comfortable and safe thanks to a patented 3-layer colouring technology.